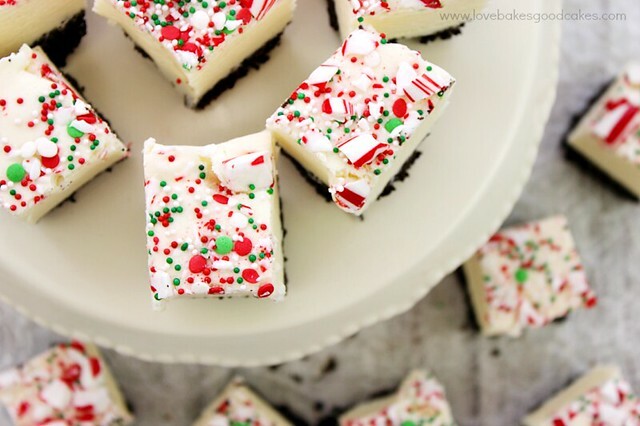 This White Chocolate Peppermint Fudge is a decadent, but easy, fudge recipe perfect for the Winter season. It also makes a great gift idea! 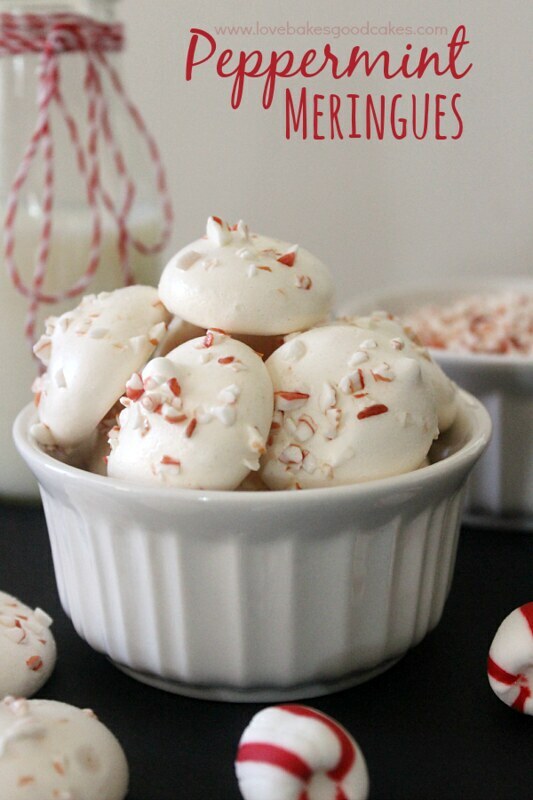 I know it’s not even Thanksgiving yet … and yes, I am posting more Christmas-y type recipes! 🙂 The life of a food blogger kinda forces you to stay ahead of the seasons and holidays just a bit. Growing up, I really don’t remember my mom doing a lot of baking … she made the occasional batch of cookies and maybe a pie or two for the holidays, but I don’t remember her making candies or fudge. Needless to say, any kind of baked treats were a real treat for us since they so rarely happened! 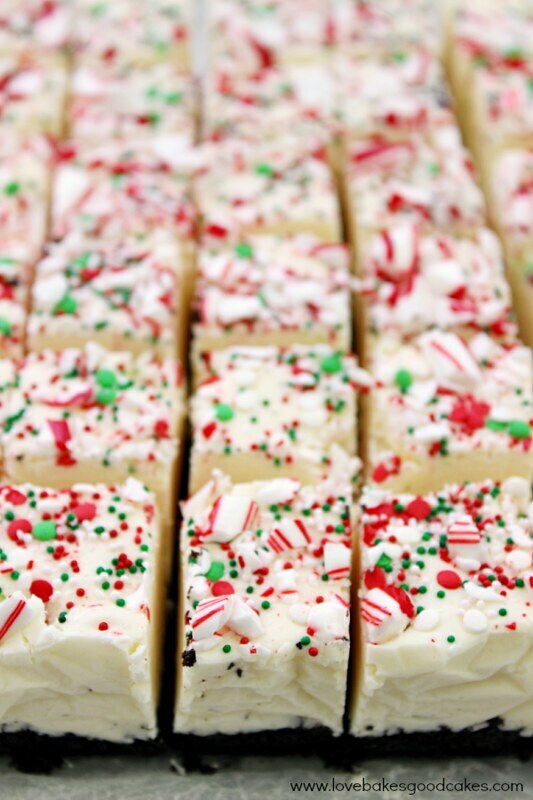 This time of year, our house is filled with all kinds of treats – cookies, truffles, pies, candies and fudge. I am fortunate enough to have several “helpers” to help me make, eat and deliver all of the yummy stuff. This fudge, y’all …. it’s so easy to put together! 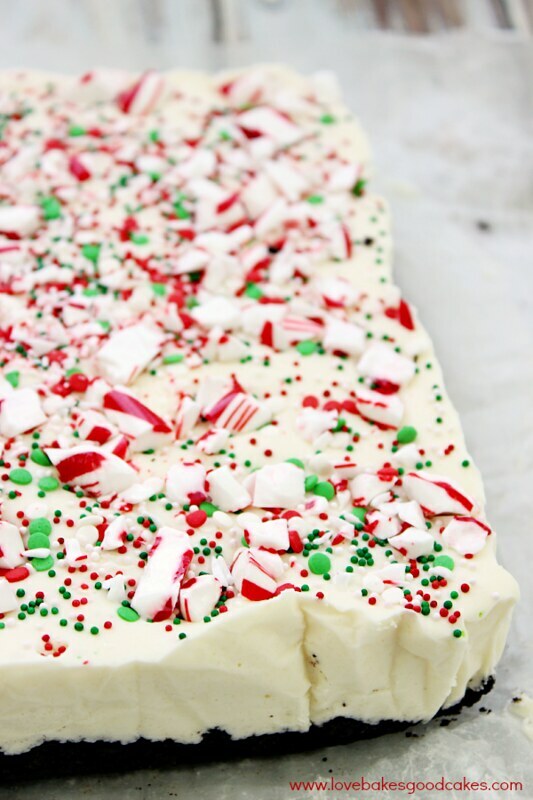 If you’re intimidated at all by the sound of making candy or fudge, this one is easy! I promise! You get a little help from instant pudding mix – and if for some reason you can’t find the instant white chocolate pudding, feel free to substitute vanilla. 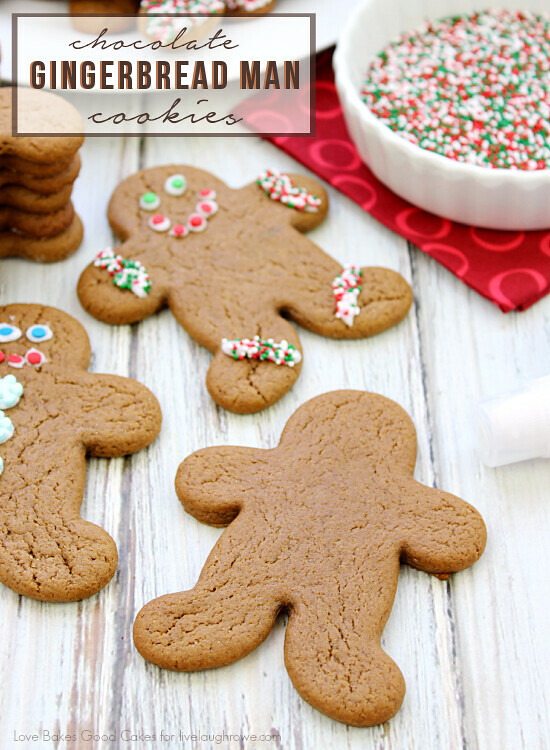 Also, feel free to use whatever holiday sprinkles you have on hand. Personally, I love the Christmas-y feel of the red, white and green sprinkles! I first shared this recipe at A Night Owl where I was a monthly contributor. Line an 8x8-inch baking pan with parchment paper and set aside. In a medium bowl, combine the cookie crumbs and 5 tbsp melted butter. Firmly press the cookie mixture into the bottom of the prepared pan. Set aside. Place the white chocolate chips, 2 tbsp butter and sweetened condensed milk in a large saucepan. Cook and stir over medium heat until the white chocolate chips are melted and the mixture is smooth. Add the pudding mix and continue to stir for an additional 1-2 minutes, thoroughly mixing the ingredients. Add the marshmallow creme and peppermint extract. Stir until combined. Remove from the heat and immediately pour the mixture over the prepared crust. 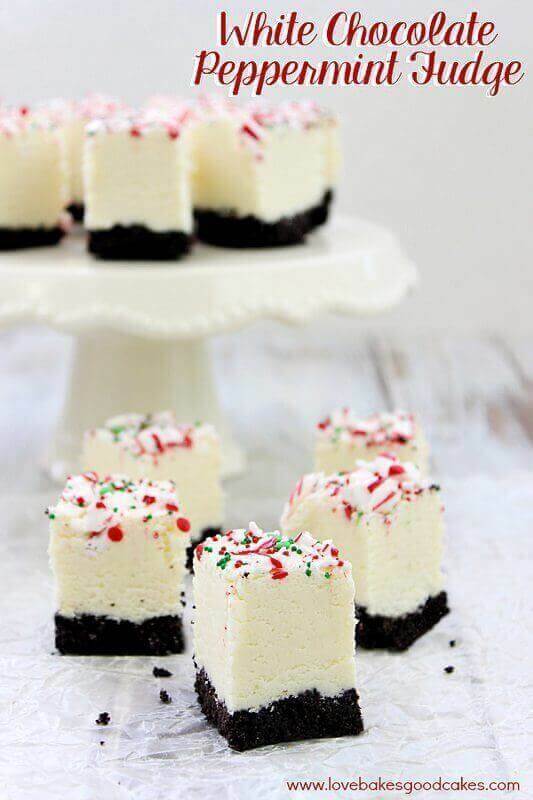 Top with colored sprinkles and candy cane pieces. 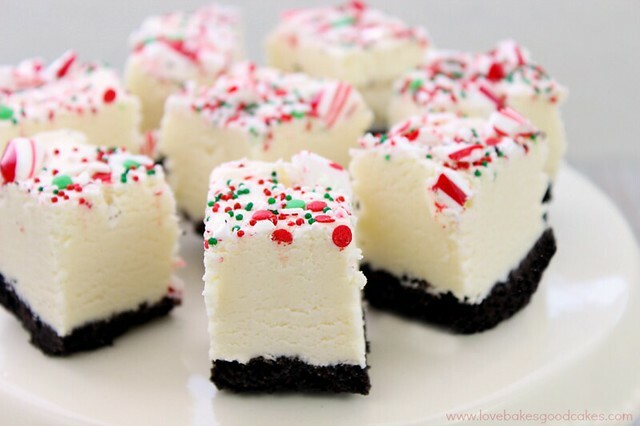 Gently push over the top of the fudge to make sure the sprinkles and candy pieces are adhered to the fudge. Refrigerate a few hours or until firm. This fudge does not need to be kept refrigerated. Store in a loosely covered container and use within a few days. 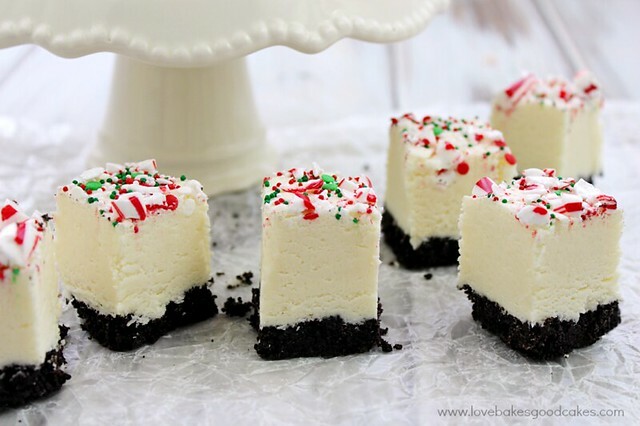 You can omit the cookie crust if you prefer. McCormick Pure Peppermint Extract, 1 Fl. Oz. So festive and fun …. This fudge looks AMAZING Jamie! Perfect for Christmas! Jamie- All your recipes look delicious! And easy. The photos are beautiful. I subscribed to your site and I can’t wait to try these! 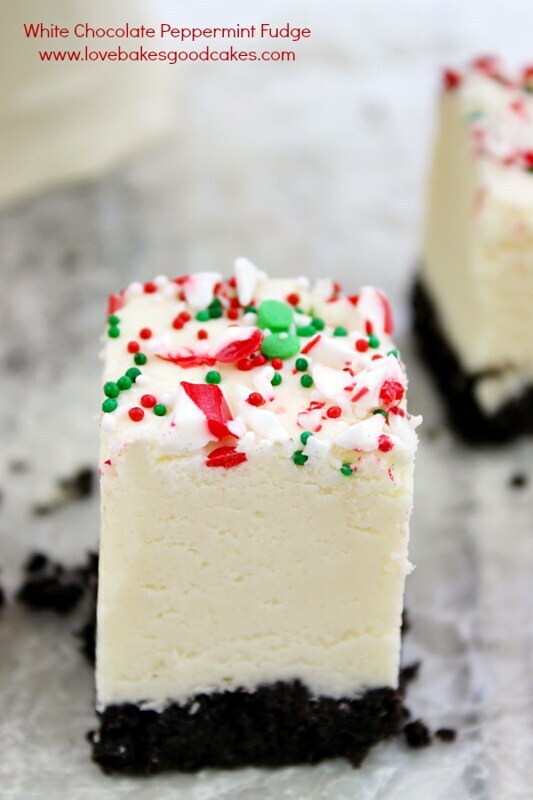 I plan to give the white chocolate fudge with beautiful red and green on top to some of my neighbors. The colors are so pretty for Christmas! Thank you for posting all these. Take care.